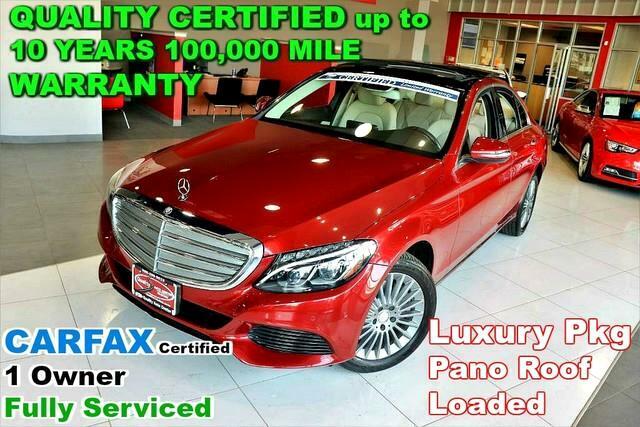 CARFAX Certified 1 Owner Fully Serviced QUALITY CERTIFIED up to 10 YEARS 100,000 MILE WARRANTY 2016 Mercedes-Benz C-Class. This Mercedes-Benz includes: POWER REAR WINDOW SUNSHADE HEATED FRONT SEATS LED HEADLAMPS Daytime Running Lights PREMIUM 1 PACKAGE PANORAMA SUNROOF LUXURY PACKAGE MULTIMEDIA PACKAGE No Credit / Bad Credit / No Paystubs, No problem !! ! All Approved ! Everyone drives ! CLEAN, GORGEOUS, LOW MILES, SHOWROOM CONDITION. CALL NOW QUALITY CERTIFIED up to 10 YEARS 100,000 MILE WARRANTY , To Certify a vehicle, there will be an additional cost for Certification. CALL NOW For details. STUNNING AGGRESSIVE LOOK ON THIS BEAUTIFUL--Call today to schedule a test drive... Good Credit/Bad Credit/No problem!!!! Get paid cash? No problem!! 100% Credit Approval with interest rates starting at 2.49% for qualified customers, our rates will not be beaten. We price our cars at wholesale price to guarantee the best deals for our customers. Our inventory moves quick, please call to confirm the availability of the vehicle of your interest Springfield location 973-564-0112. This vehicle is located at our SPRINGFIELD location. Come visit our new showroom in Springfield NJ. *Note - For third party subscriptions or services, please contact the dealer for more information. * This is a well kept ONE-OWNER Mercedes-Benz C-Class C 300 Luxury 4MATIC - with a full CARFAX history report. Put performance, safety, beauty, sophistication and all the right amenities into a car, and here it is! Now you can own luxury without the luxury price tag! Save money at the pump with this fuel-sipping Mercedes-Benz C-Class. This Mercedes-Benz C-Class is equipped with AWD for improved handling. Whether you're faced with inclement weather or just out enjoying the twisting back road, you'll have the grip of AWD on your side. Exceptional in every sense of the word, this incredibly low mileage vehicle is one of a kind. Rest assured, this vehicle was well care for. In fact, previous service records are included. Clean interior? How about flawless. This Mercedes-Benz C-Class looks like has never been used. There should be no doubt in your mind about purchasing this 2016 C-Class C 300 Luxury 4MATIC -. This lightly-used vehicle is still covered by the Mercedes-Benz factory warranty. High performance is what this vehicle is all about. You will be reminded of that every time you drive it. Treat yourself to a wonderful driving experience in this wel- optioned Mercedes-Benz C-Class C 300 Luxury 4MATIC -. Equipped with the latest in driver comforts, this Mercedes-Benz is the benchmark of modern automotive engineering. This Mercedes-Benz C-Class is equipped with navigation, so you no longer have to wonder if you're headed in the right direction. You know the the previous owner washes and polishes the vehicle with great care and detail? It's in impeccable condition. If you're looking for a one-of-a-kind automobile, look no further. We are proud to offer this 2016 Mercedes-Benz that truly a must-have. This vehicle's wheels are one of the many attractive features that this C-Class C 300 Luxury 4MATIC - has to offer. More information about the 2016 Mercedes-Benz C-Class: The C-Class has traditionally been Mercedes-Benz' entry-level car. However, with the arrival of the CLA, the C-Class is no longer the German automaker's least expensive model. Mercedes-Benz has packed the 2016 C-Class full of upscale technology, determined to make the car feel anything but entry level. Despite this move upmarket, pricing on the C-Class remains competitive with other European small sedans such as the BMW 3-series. The 2016 C-Class starts at around $40,000. Interesting features of this model are high-end features, all-wheel drive, Attractive modern styling, fuel-efficient diesel and hybrid engines, plus powerful turbocharged engines, and typical Mercedes-Benz luxury No Credit / Bad Credit / No Paystubs, No problem !! ! All Approved ! Everyone drives ! CLEAN, GORGEOUS, LOW MILES, SHOWROOM CONDITION. CALL NOW QUALITY CERTIFIED up to 10 YEARS 100,000 MILE WARRANTY , To Certify a vehicle, there will be an additional cost for Certification. CALL NOW For details. STUNNING AGGRESSIVE LOOK ON THIS BEAUTIFUL--Call today to schedule a test drive... Good Credit/Bad Credit/No problem!!!! Get paid cash? No problem!! 100% Credit Approval with interest rates starting at 2.49% for qualified customers, our rates will not be beaten. We price our cars at wholesale price to guarantee the best deals for our customers. Our inventory moves quick, please call to confirm the availability of the vehicle of your interest Springfield location 973-564-0112. This vehicle is located at our SPRINGFIELD location. Come visit our new showroom in Springfield NJ. Check out this gently-used 2016 Mercedes-Benz C-Class we recently got in. Today's luxury vehicle is not just about opulence. It's about a perfect balance of performance, comfort and attention to detail. This 2016 Mercedes-Benz C-Class is the perfect example of the modern luxury. Outstanding fuel economy and sleek styling are two great reasons to consider this Mercedes-Benz C-Class. No matter the weather conditions or terrain, this Red AWD Mercedes-Benz C-Class handles with an elegant confidence. Fine interior appointments complement this vehicle's unprecedented performance. Exceptional in every sense of the word, this incredibly low mileage vehicle is one of a kind. More information about the 2016 Mercedes-Benz C-Class: The C-Class has traditionally been Mercedes-Benz' entry-level car. However, with the arrival of the CLA, the C-Class is no longer the German automaker's least expensive model. Mercedes-Benz has packed the 2016 C-Class full of upscale technology, determined to make the car feel anything but entry level. Despite this move upmarket, pricing on the C-Class remains competitive with other European small sedans such as the BMW 3-series. The 2016 C-Class starts at around $40,000. Strengths of this model include high-end features, all-wheel drive, Attractive modern styling, fuel-efficient diesel and hybrid engines, plus powerful turbocharged engines, and typical Mercedes-Benz luxury No Credit / Bad Credit / No Paystubs, No problem !! ! All Approved ! Everyone drives ! CLEAN, GORGEOUS, LOW MILES, SHOWROOM CONDITION. CALL NOW QUALITY CERTIFIED up to 10 YEARS 100,000 MILE WARRANTY , To Certify a vehicle, there will be an additional cost for Certification. CALL NOW For details. STUNNING AGGRESSIVE LOOK ON THIS BEAUTIFUL--Call today to schedule a test drive... Good Credit/Bad Credit/No problem!!!! Get paid cash? No problem!! 100% Credit Approval with interest rates starting at 2.49% for qualified customers, our rates will not be beaten. We price our cars at wholesale price to guarantee the best deals for our customers. Our inventory moves quick, please call to confirm the availability of the vehicle of your interest Springfield location 973-564-0112. This vehicle is located at our SPRINGFIELD location. Come visit our new showroom in Springfield NJ.